If YOLO is still a thing this sheep right here is doing it right. This lesson in Animal MMA is brought you by living your best life. Our sheep friend here is living his best life. 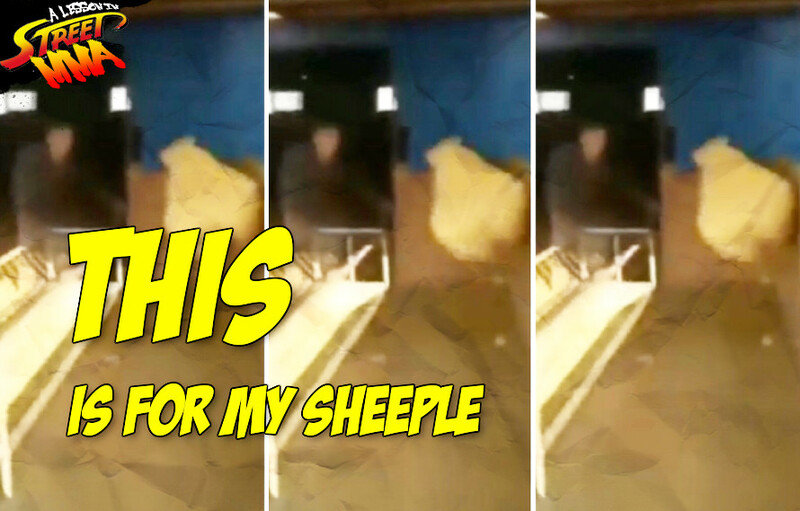 We’re just going to assume after this video stopped recording, Showtime Sheep led a massive rebellion. He burned that place to the ground and set all of his animals free. No wool or lamb meat on this day. 99.99% sure this exactly what this sheep was trying to say when he ran towards the wall, jumped off it, and kicked that random dude in his face. We have no idea the backstory, but we’re guessing that guy deserved the Benson Henderson treatment. Animal cruelty ain’t cool, can that sheep get an amen? Great, now we’re going to picture our sheep hero wearing glasses, getting angel wings tatted on his back, and spitting out a toothpick when he’s done with the fight. Also, who really knows why the sheep took on the persona of Benson Henderson rather than Anthony Pettis. Sometimes these thing happen in Animal MMA. For now we’re just going to watch that sheep Showtime Kick that dude in the face, on a never ending loop. This is how George Orwell’s Animal Farm really should have ended; a swift kick to the face of a human. Video: Did a flying bat really try to attack Ronda Rousey on Monday Night Raw?